"We don't call it tribalism, we call it nationalism, it's the same thing. If you're Canadian or from the U.S., Indian or Chinese and the whole thing about whose fault was it and: You have to say sorry. No, you have to say sorry. It's all a very male, adolescent thing." Deepak Chopra looks relaxed. A few hours after he leaves our meeting -- seven, to be exact -- he'll be speaking to a crowd of about 4000 people who will all have paid between $45 and $125 to be brought towards enlightenment by his sonorous voice. And, when he delivers his message, he will be electric and compelling. Right now, however, on the last day of a 21 city tour, he's almost not even here. "And I feel more comfortable," in the experience of meditation, "than I feel in, you know, every day [life]." It's difficult to reconcile this Deepak with the one seen booming from podiums and illuminating from videos. Firstly, he's not as tall as expected. The bestselling author who is shaping up to be an international spiritual leader is of average height or slightly less. His speaking voice -- when not enunciating for a crowd -- is soft and you find yourself leaning in close to make sure you catch each delicately accented syllable. Despite the fact that he's written 30 books which have collectively sold in excess of 10 million copies and who is read by people as far ranging yet influential as the Dalai Lama and Oprah, Chopra is modest enough to irritate an interviewer. His accomplishments are brain-numbingly impressive but he goes out of his way to show that, even if everyone else is impressed, he is not. In person, Chopra's magnetism and brilliance are not unexpected. What surprises, however, are his flashes of ironic humor. When asked about his ultimate goal, for instance, Chopra responds with a laugh that he hasn't decided what he wants to do when he grows up. During our conversation, only one thing brings him to the point of high animation. On the day of our interview, the local morning newspaper has run a story on him that includes a quote by someone who thinks Chopra's latest theories are hooey. Victor J. Stenger, professor emeritus of physics and astronomy at the University of Hawaii is quoted as having written that, "no compelling argument or evidence requires that quantum mechanics plays a central role in human consciousness or provides instantaneous, holistic connections across the universe." "I'd love to do a public debate with people like that, you know?" responds Chopra. "The fact is, to me it's shocking that some quantum physicists don't know their quantum physics." If Chopra is as game for a public debate as he seems, one would think some reality television producers are missing the boat. Survivors on an island? How passé. Chopra is offering to show you the face of God while practically guaranteeing it won't be the face you expected. It's a tough game to beat. His most recent book, How to Know God: The Soul's Journey Into the Mystery of Mysteries, has been described as his most ambitious and important to date. And while it also seems to be the book most inviting controversy, Chopra seems a little surprised and almost disappointed when he reports the controversy around How to Know God has been practically nil. At worst, Chopra feels that the quiet might just indicate that some people are trying hard not to pay attention. "A lot of people ignore things when they don't know how to deal with it." In How to Know God Chopra proposes that the human nervous system has seven biological responses that correspond to seven levels of divine experience. He weaves his theories with input from the fields of psychology, neurology and quantum physics to tell us that, not only is God not dead, but all of us have been hardwired to find him. While all of this sounds esoteric enough to send all but the New Age rabble running, How to Know God, recently released in paperback, has been Chopra's bestselling work to date. No small feat, considering that each of his books -- from Ageless Body, Timeless Mind to The Seven Spiritual Laws of Success -- have seemed to outsell the next and collectively they have created a trail to spiritual awareness unsurpassed by any writer or spiritualist in recent memory. 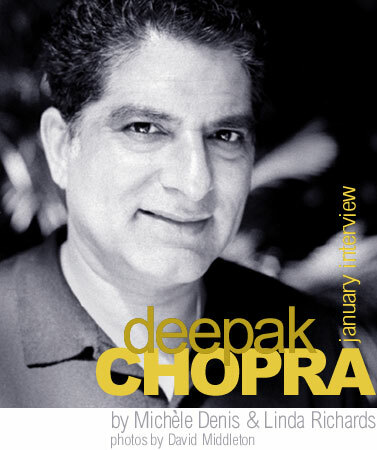 Born in India, Chopra, now "chronologically" 53, lives in San Diego with his wife, Rita. An M.D. and neuro-endocrinologist, he is the founder and present CEO of the Chopra Center for Well Being in La Jolla, California. January Magazine: How long have you lived in the United States? Deepak Chopra: Since 1970. So 31 years. I know you were educated partly in India and partly in the United States. Yes. I went to medical school in India and I did my training in Boston in internal medicine and endocrinology -- neuro-endocrinology -- I did my residencies and fellowships and teaching at [Boston University] Medical School and Harvard Medical School. I had a practice in Boston. I was in Boston from 1970 to 1993. I moved to California eight years ago. What year did your first book come out? I think it's 28 now. And 30 at the end of the year. How do you keep finding the inspiration? Well, I have a lot of time on airplanes. That's enough to do a book. I've written several books on flights. Do you work on a laptop or in longhand? Both. I do all kinds of things. I work on a laptop. I write longhand. I tape record. In 1999, Time magazine named you one of the top 100 icons and heroes of the 20th century. That's got to be kind of scary. No. I think what happens is, 10 people get together and throw around some names and then they make a list. There are so many lists. People magazine has their own and everyone does their own. It's true. But they didn't pick me: they picked you. But I'm just in the public eye. How does that feel, though? I would think it would have a positive influence on your practice. It certainly makes you able to convey your message to more people. You know, a lot of people don't pay attention to it. To your message or to the fact that you're an icon? The fact that Time magazine did that. It's just a magazine, you know? A lot people don't look at that. Ignore it. It never influences the directions that you take? No. I think a lot of people wonder whether it's true. A lot of people think: Time magazine isn't as good as it used to be. [Laughs] It really doesn't influence anything. How to Know God has widely been called your most important to date. Do you agree? Has there been controversy [with this book]? Surprisingly, no. But, as you've seen in the book itself, there are endorsements from Catholic priests and nuns and rabbis, the Dalai Lama and the head of the Sufi movement. I've got, basically, all the major religious leaders endorsing the book. And they're internationally known: all of them. So there hasn't been controversy. Maybe a little bit from fundamentalists in the U.S. But, by and large, no. I'm actually surprised. That is surprising. What is that about, do you think? Is it the right message at the right time? Are you the right messenger? Or they're ignoring it. A lot of people ignore things when they don't know how to deal with it. I think the fundamentalists, some of them, attack it and the rest ignore it. I was on Larry King with, what's his name? The son of Billy Graham? And he was waving his Bible throughout the show: That's the only book that counts. A lot of people believe that and fine. We're not going to fight against the Bible, right? How to Know God is quite different than some of your earlier works [which are largely health-related]. I can see the connections, but you're really moving. Firstly, I'm going to go back to do some other stuff in the area of health. But how did that journey happen for you? What took you in this direction? I think that everything I've done is consciousness-based. So, ultimately, this is a book about consciousness itself. So, all the other books are based on consciousness and this is a book about consciousness. It's just an extension, I think. Absolutely. "Health" and "holy" are the same words. How could this book approach someone that may not be a spiritual person? Someone who may not believe in God? How do you think it would speak to them? They probably won't read it, so it won't be speaking to them. I think this is a book for people who are curious and at the same time want to feel that there's a higher form of intelligence. That there is a lot that you need to look for if you want to answer questions like: Who am I? Where did I come from? What's the meaning and purpose of my existence? What happens to me after I die? Do I have a soul? What is God? And, even if God exists, does God care about who I am? So this a book for those people. I think if you're wedded to the idea that there is nothing like that -- nothing like higher intelligence -- then you're not going to look at it. And if you're already programmed into believing that God is a dead white male in the sky, then also you're not going to look at it. So I think this is a book for those who are looking and are curious and are on a spiritual search. I don't think it's for anybody who is not on a spiritual search. And a lot of people are looking right now. That's part of what you're talking about. A lot of people are looking because they're not satisfied with the old answers. I mean, if you're really honest, all our religions come from a period of history when we were tribal. They're all tribal religions: they're about the tribe. All of them. It's not just Judaism, but the Eastern religions as well. They evolved from a tribal culture. The fact is that they were meant to nurture and make the tribe feel secure and that's why we've had religious conflict: tribal war. Today also, all the conflict in the world is still the same thing: It's tribal and it's religious. So as we move into a more global culture I think people are slowly and hopefully going to go beyond their tribal nature. It's going to take a while, because it's so programmed in our genes. We don't call it tribalism, we call it nationalism, it's the same thing. If you're Canadian or from the U.S., Indian or Chinese and the whole thing about whose fault was it and: You have to say sorry. No, you have to say sorry. It's all a very male, adolescent thing. How do we move beyond that? It'll happen. Slowly maybe. A couple of generations. Is How to Know God a start? Will people ever get to the point where their individual spiritualism is more important than their tribal spiritualism? It's not going to happen soon. It's not going to happen for a couple of generations, if that. Ultimately it's only going to happen -- if it happens -- because of technology. You think technology will bring us closer to individual spirituality? Yeah. The Internet and all the other technology. What will happen -- maybe, it depends on which way the critical mass moves -- technology makes it easy for everyone to share information. And when there are no secrets left, it's very difficult to create separation. Because people are no longer ignorant. Right. I see the evolution of humans from hunter/gatherers to the age of agriculture to the age of industry to the age of information to a knowledge-based society and then a wisdom-based society. Maybe. But we're definitely in the information age now and that's making a big difference. People are aware in China and they're aware in Saudi Arabia and, you know, you do a program on CNN International, you get calls from Saudi Arabia and Kuwait and Indonesia. And you do see that all the so-called totalitarian regimes where people have tried to control [the people] are very fragile because of information. The Internet is unstoppable. In Iraq they have all these rules about satellite dishes but people still put them up at night so they can watch international programs. Unstoppable in a way, but it'll take a long time. Because, you know, even if it's unstoppable, what are they seeing? They're seeing American trash. They're seeing Hollywood soap operas. So it's not that it's becoming a global culture, it's all becoming one tribe. The tribe is America and everybody resists that, because it's nothing to be proud of anyway. So they don't see Americans or any other cultures as a collective of individuals as a big group that they shy away from? Or embrace. What's happening is the totalitarian leaders, rightfully, are afraid of it. And the others are attracted to it. Not because they think it's great, but because it's attractive because of its seductiveness. But isn't that a fear of losing the tribe? It's all becoming the American tribe: McDonald's tribe. I was thinking that when you talked about putting up the satellite dishes at night: They're putting them up to watch Ally McBeal. Absolutely. There's data now that actually confirms that the Soviet Union came down and the Iron Curtain came down as a result of Dallas, the soap opera. There were more people watching Dallas in the Soviet Union and East Germany who were attracted to the car, to the woman's dress and the house and J.R. and all of that. Easy access to food and education and all of that? Yeah. So maybe it's a step in the right direction. It's unpredictable. I don't know. Technology is neutral. What we do with it is up to us. How did you come up with the seven responses? They're actually representative of the seven chakras and so they're a biological explanation of the seven chakras. What are people asking you about the most on this tour? One of the most difficult things to convince people of on the tour is either they haven't read the book very carefully, or they've read it and they don't want to face certain ideas in the book because the essential idea in the book, ultimately, is that there's no such thing as a person or an individual. There's only the universal that expresses itself as a person. That ultimate spiritual freedom comes only from relinquishing the person and recognizing that the individual is just a pattern in the [universe] and unless we can exponentially know that, there is no coming out of the prison. People don't want to lose their individuality. What will happen to me after I die? I say: Which you? The old one? Or the young one? Or the adolescent one? Or the child? I mean, people have such primitive ideas, you know: I'm going to die and then I'm going to meet my relatives. And they visualize their relatives the way they saw them last time. And, of course, the relatives visualize their ancestors the way they saw them last time. And if you're going to survive as a soul, which one are you going to survive as? If supposing you're senile when you die, are you going to be doomed to eternal senility? The image of Christ we have as a 33-year-old man, is he still 33 years, or is he 2033 years old today? What is time? There's lots of concepts there that you've got to get rid of if you want to really embrace the spirituality that I'm trying to articulate there, but it's difficult. It's fearful too, for people. What was the influence for the thought that instead of the physical being thinking the thoughts, the thoughts create the physical being? That goes back to my training as a neuro-endocrinologist. The discovery of neuro-peptides is very crucial to that understanding: the thought always precedes the molecule. First there's thought, then there's energy and information and then there's the molecule. That's the sequence. It's pretty well scientifically understood. This was the major discovery in neuroscience in the 1970s. Thought, information and energy and matter: that's the sequence. Is How to Know God something that your work has been building towards? And where do you build from here? There's a lot. I can go back to some of the stuff. I'm doing a book now, a very practical book, called Grow Younger, Live Longer: The 10 Ways to Reverse Aging. And I'm also doing a book on death. One is about getting younger and one is about dying. They're all part of life. How did [your novel] The Return of Merlin get into all of this? I spend a lot of time in England. It's one of my favorite countries. Particularly the southwest part of England: Cornwall. I've spent a lot of time collecting picture postcards from castles and monuments. What I call "nickel knowledge" because you can get it for a penny. So one day I was sitting with the postcards altogether and I thought there was a story there. Will you ever write another novel? I'm writing one. In fact, the book about death is a new novel. It's called Soul Mates. It's coming out this year. I know that you're speaking tonight. It sounds like a good crowd: over 3000 people. What are you going to talk about? I'll decide when I'm there. Is there an ultimate goal [regarding] what you want to say to people? Biologically I'm 25, chronologically I'm 53, psychologically it varies. I go scuba diving. I ski. Watch movies. I take a week of silence every three months in the wilderness. And, besides, I have fun all the time anyway. Do you have favorite places in the wilderness that you like to go to? I got to Costa Rica. Rain forest. I go to the canyons in Utah. I go to Scotland: the north of Scotland. I go to India. I go to the outback in Australia. Do you miss having a medical practice? No because I think in a way I do have a medical practice: much larger. We have a center, we have physicians there. And, when I'm there, they present me all their cases and I sit down and we discuss the patients and I also sit down with the patients in the group and answer their questions. It's just that I don't sit one-to-one. I keep up with everything that's going on in the medical field. I continue to do my CME [Continuing Medical Education] credits and all that and so I don't miss it. But I have patient contact. Do you think that you're bringing philosophy back as a science? Yeah. I think to some extent I am. But, again, you know I'm not an academic. So mainstream philosophers always have a problem with what I write, as do mainstream scientists. Everybody has a problem with what I write. Well, the problem is that they spend years and years in academia going into the intricacies of philosophic and existential dilemmas and then I come and say: Oh, the seven ways, or something. They think it's too simplistic. It should be simple though, shouldn't it? It should be, but what would our academics do if we said it was that simple? Were you brought up with traditional beliefs? My mother was very traditional in her background -- Hindu background. My father didn't really have any religious leanings although he was very spiritual. I went to a Catholic school. Did all of those influences help direct you? I lean towards it. But I'm not a compulsive obsessive fanatic about anything. I mean, there are some great principles and it's very scientific in its understanding. But I'm not compulsive, no. I meditate twice a day. I meditate two hours every day. I spend at least an hour working out. So that's three hours every day of something mind/body discipline. Other than that: nothing. Is that something that's difficult to find the time for? I make the time. Yesterday I was flying in from Milwaukee. I got up at four and went to the gym. I did my meditation. And I enjoy it. This morning I've done my workout and after this lunch, before I go this evening, I'll spend maybe another hour in the gym. I like going into the gym. I feel very fresh. Are you constantly surprised by the things that you discover? Remember I spend two hours every day in meditation. It's like a habit for me. And then when I go every two months for a week of silence in the wilderness, it's a week of no contact with human beings or even a book. So I'm pretty used to being in a place where insights keep coming. And I feel more comfortable in that experience than I feel in [indicates the table between us] you know, every day life. Although I'm integrating the two. How hard is that integration for you? I don't know. I don't get tired. I don't get sick. I don't have any anxieties. I have a good time even on a hectic tour of 21 cities: I enjoy it. But there's a part of me that's not involved. You know, it's like my body and my mind are doing it and I'm still... [spreads his hands in a peaceful, contemplative gesture]. How much do you believe that physics are a part of spirituality? A lot. I mean, I saw the article in The [Vancouver] Sun. And they've got some comments from some professor of physics and astronomy from Hawaii or something. He says that consciousness has nothing to do with quantum physics. I'd love to debate a guy like that. I don't know where these journalists -- sorry: you're a journalist, but -- where they find these guys, because the best quantum physicists -- and they are friends. I mean, I have the head of the Max Planck Institute at my center every month. There's no bigger place for quantum physics in the world than the Max Planck Institute in Germany. And I have Amit Goswami who is a professor of physics at Oregon State University and Nick Herbert: I can name 20 quantum physicists who have written hundreds of papers on the relationship between quantum physics and consciousness. So when I read a quote like that, it's almost laughable. A guy like that -- the fellow they mentioned -- I'd love to do a public debate with people like that, you know? Has that ever happened? Where people have debated you in public? Rarely. But I'd like to because, you know, the fact is to me it's shocking that some quantum physicists don't know their quantum physics. When talking about God, the challenge for a lot of people is in getting the traditional images out of their heads. As you said earlier: the dead white male in the sky. I think perhaps you're trying to move towards a more encompassing model of God. Try and have this image: here's one planet, called planet Earth. And even in our own galaxy, it's a speck of dust. There are thousands of stars -- millions of stars -- with planetary systems with specks of dust like ours. This galaxy is part of millions of other galaxies and even as we speak, there are giant stars exhausting their thermonuclear energy, collapsing into singularities and exploding through time warps and space time warps into other universes. For us to say that some guy 2000 years ago [who] lived in Palestine is in charge of all this... or some other guy who lived in Arabia 2000 years ago or India or whatever. I mean, really, we are limiting God. It's not justice to God to limit God into the volume of a body or the span of a lifetime or an ethnic background. So [the traditional image of God] is a facile, childish image? Totally. Three philosophical arguments are used to support the idea of God: The first is the so-call ontological argument which says the fact that we think about God means there must be a God because otherwise our nervous system wouldn't be able to conceive a God. In other words, we would not be able to create that which does not exist. That's it. That's the ontological argument. The second is the cosmological argument that says that in a universe of endless causes there has to be a first cause, which is a-causal. And the third is the so-called teleological argument that says that where there is design, there must be a designer. But, I think most people who are reasonably scientific would agree that if you define God, you limit God. If you have an image of God, that image conforms to your level of awareness or your projection. And yet, we can't go beyond what we think. In stage seven we can. Can we get to stage seven and then rest? Linda L. Richards is the editor of January Magazine. Her fourth novel, Death was the Other Woman, is published by St. Martin's Minotaur/Thomas Dunne Books.